PLEASE NOTE -- This site only shows US dollars. Go to HomeAway.ca for accurate rates. 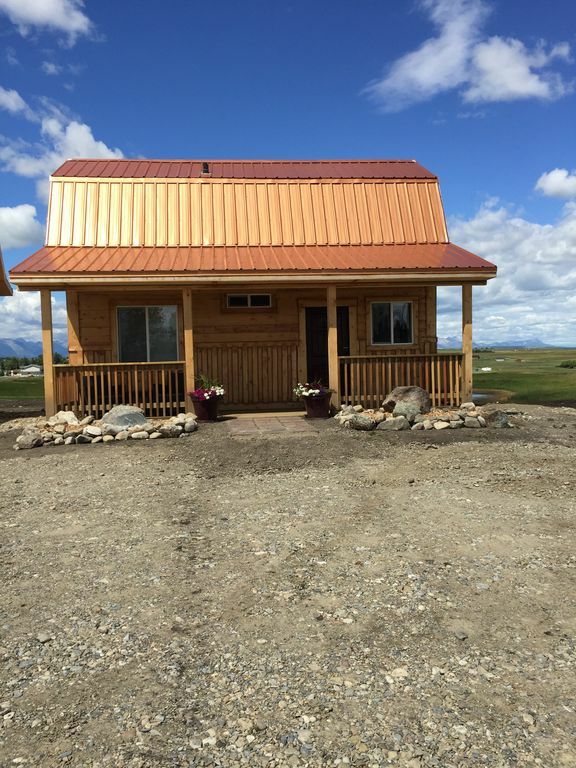 Mountain Haven Cabins is a STUNNING property located 15 minutes from Waterton Park. Magnificent mountain views. You will be absolutely thrilled for a chance to stay at this property. Mountain Haven Cabins are Perfect for those wanting to be close to the park , or a quiet weekend away. Great for 2 -3 couples or small families This cute country style cabin has 2 Bedrooms, Queen bedroom on the main floor and 2 queen beds and 1 single bed in the loft. Complete with bathroom, small kitchen and a living room. Enjoy a evening on your private deck complete with a gas BBQ. We are an extended family on property homesteaded by Mary's Great Grandparents. Dennis and Mary are now grandparents to 25 Steve and Chelsea and their 6 boys and 1 girl are the builders and dreamers of this amazing adventure. This Cabin is brand-new construction. Each Cabin is great for a small family. However there are 3 cabins that if booked together would be great for extended families for a reunion. We are only 15 minutes from Waterton Park and you cannot imagine the beautiful view of the mountains and the sunsets. When you wake up in the morning, or when the sun is setting you will see the mountains for what they were intended-Majestic. The view is worth a million dollars, you will not find another one like it. Please bring 'outside' towels with you for playing in the creek or enjoying the water in the park. dishes enough for 7 people. There are also kettles, fry pans, a toaster, coffee maker, serving bowls, blender, pancake griddle and a cookie sheet. This is a Wonderful getaway Cabin! What awesome mountain views can be seen from the windows! Cabin was perfect and close to Waterton Lakes National Park. Mary, our hostess was very accommodating, even brought us Marshmellows and Fire wood. This cabin is so beautifully decorated and is stocked with everything you would need. We would highly recommend this cabin to anyone! Thanks for a great stay! Property was not ready upon arrival. Property is okay, but not really worth the amount paid. Loved this cabin for all its thoughtful touches and comforts, and magnificent and peaceful surroundings! Excellent proximity to Waterton Lakes National Park. Quaint, clean, and hassle-free! A tiny gem on the outskirts of Waterton. Booked at the last minute and loved our two nights there. The cabin is quirky and full of character inside and the views are spectacular. Only 15 mins from Waterton, it is ideally placed to explore this beautiful park. This is a perfect place to unplug and unwind. It has fantastic views. This is a well built, beautifully decorated cabin about 15 minutes away from Waterton. Be sure to buy your groceries before you come as there is only a small convince type store nearby. The cabin was great! Situated right outside Mounrain View on a comfortabele distance to the park. Special kind of cabins, not very much space downstairs but with a Special attractieve atmosphere and tastfully decoratief. For two it's perfect, four is in my view the Limit although zeven could sleep in a cabin. You feel very remote from the rest of the world which I experienced as a blessing! The hosting family is very friendly and helpfull. This little village is only 15 minutes Cardston or Waterton Park . The quiet peaceful rural area is good for the soul.